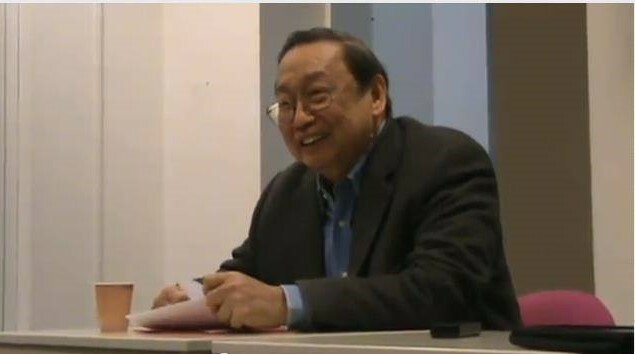 Jose Maria Sison: On the significance of the Great October Socialist Revolution | Fight Back! Fight Back News Service is circulating the following statement by Prof. Jose Maria Sison, Founding Chairman Communist Party of the Philippines that was sent to the Oct 14 Minneapolis celebration of the October revolution. The address can be viewed on youtube. I am highly honored and deeply pleased to convey warmest greetings of solidarity to the Freedom Road Socialist Organization on the occasion of its celebration of the 100th anniversary of the Great October Socialist Revolution and to give some brief remarks on the significance of this earth-shaking revolution. The epochal struggle between the proletariat and the bourgeoisie was first defined by Marx and Engels in the Communist Manifesto of 1848 in the era of free competition capitalism. The objective conditions of 19th century Europe gave rise to a series of historic events: the workers’ uprisings in 1848, Marxś thoroughgoing critique of capitalism, the International Workingmen´s Association, the Paris Commune of 1871 as prototype of the proletarian dictatorship, the Second International and the rise of Marxism as the main trend in the European working class movement in the last decade of the 19th century. Lenin extended and developed the theory and practice of Marxism to the stage of Marxism-Leninism in the era of modern imperialism and proletarian revolution. He made significant contributions to Marxist philosophy, political economy and social science. He upheld, defended and advanced the revolutionary essence of Marxism not only against the overt ideologists of the bourgeoisie but also against the classical revisionists headed by Kautsky in the Second International. Most important of all, Lenin led the Bolsheviks in the overthrow of Tsarism in Russia in February of 1917 and then in the overthrow of the bourgeois Kerensky government on October 25, 1917 in order to establish the first durable socialist state on one-sixth of the surface of the earth. The most crucial element in socialism is the class dictatorship of the proletariat defeating that of the bourgeoisie and nationalizing the land and strategic industries, despite the vestiges of feudalism and medievalism, the exigencies of civil war and resistance to foreign intervention and transitory measures like "war communism” and the New Economic Policy. Even while he was preoccupied with the immediate tasks of consolidating the Union of Soviet Socialist Republics, Lenin paid attention to the prospective stage of socialist construction and the promotion of the world proletarian revolution through the Third International or the Comintern against the rule of the monopoly bourgeoisie in the centers and periphery of imperialism. After the death of Lenin in 1924, Stalin followed up the New Economic Policy with full scale socialist industrialization and the collectivization and mechanization of agriculture and expanded the work of the Third International, especially to the colonies and semi-colonies where the bourgeois democratic and socialist stages of revolution are well defined. As a pioneering socialist country, the Soviet Union demonstrated how in so short a time through a series of five-year economic and related plans, the proletariat, peasants and other working people could lift themselves up politically, economically, socially and culturally. In the face of the imperialist powers and the rise of fascism, the Soviet Union was able to strengthen itself in an all-round way and build a powerful Red Army under the leadership of the Communist Party. In World War II, the Allied Powers could defeat the Axis powers because of the decisive role of the Soviet Union in defeating the Nazi German invasion and in rolling back the fascists in an epical counteroffensive. After World War II, the Soviet Union recovered fast from the destruction wrought by the Nazi German invasion to 75 per cent of Soviet industry and death to 27 million Soviet citizens. It continued to be the bulwark of socialism and the national liberation movements in colonies and semicolonies. It was able to develop its own nuclear weapons in order to counter the US nuclear monopoly and blackmail. It stood as an inspiration to the proletariat and oppressed peoples of the world. Within the first half of the 1950s, one third of humankind lived in socialist countries and people´s democracies led by communist and workers´ parties. But after the death of the Stalin in 1953, the modern revisionists headed by Krushchov were able to split the followers of Stalin and gain power in the Soviet Union in 1956. They instituted capitalist-oriented reforms within the ruling party, the state and the economy and propagated bourgeois populism and pacifism. Brezhnev took power in 1964, continued the restoration of capitalism, recentralized the ministries, plunged into an arms race with the US and engaged in social imperialism. The Soviet Union went into serious economic stagnation and deterioration from the latter half of the 1970s. By the time of Gorbachov, it was ripe for social disorganization and undisguised restoration of capitalism. It collapsed in 1991. We are still in the era of modern imperialism and proletarian revolution because the modern revisionists betrayed socialism and succeeded in subverting socialism and restoring capitalism in the Soviet Union and elsewhere, causing a temporary retreat of the socialist cause and preventing socialism from becoming dominant in the world for the time being. However, upon the integration of former socialist countries in the world capitalist system, with Russia and China becoming big capitalist powers themselves, contradictions among the imperialists, between capital and labor, between the imperialists and the oppressed peoples and between the imperialists and countries assertive of independence have intensified more than ever before in what is now a multipolar world. For a while, from the time of the collapse of the Soviet Union in 1991, U.S. imperialism appeared to be the sole superpower in a unipolar world in which it could impose its will and brute force on the people of the world. But since then, the US neoliberal economic policy and neoconservative policy of full spectrum dominance have resulted in more frequent and worse crises and wars that have in fact undermined and debilitated U.S. imperialism. The strategic decline of US imperialism has accelerated in the 21st century. The U.S. is upsetting the world capitalist system with further crises and wars by desperately trying to reverse the trend. Its former hubris over Francis Fukuyama´s perpetuity of capitalism has turned into anxiety over Graham Allison´s Thucydides Trap. The October Revolution remains highly significant and urgently relevant today to the proletariat and peoples of the world. It tells us to develop the subjective forces for winning the revolutionary struggle against imperialism and for socialism. We need to build the Bolshevik-type of revolutionary party of the proletariat that has a mastery of materialist dialectics and struggles against imperialism, revisionism and all reaction. Lenin teaches us that it takes a whole historical epoch for socialism to prevail over capitalism on a world scale and Mao also teaches us that in socialist countries there must be continuing revolution under proletarian dictatorship to combat revisionism and consolidate socialism. Under the leadership of the proletarian party with communist foresight, we need the revolutionary trade unions and the mass organizations of various oppressed classes and sectors of society. We need the Red Guards or the self-defense units of mass organizations and communities and the Red Army or people´s army wherever possible and necessary. We need to build the soviets or the local organs of political power that will become the base of the socialist state. We need the alliances in every country, the anti-imperialist solidarity of peoples and proletarian internationalism. We need to develop all the revolutionary forces and resources for waging all forms of struggle and winning the revolution against imperialism, revisionism and all reaction.